Re-create the dance hall days of the past with this classic effect. 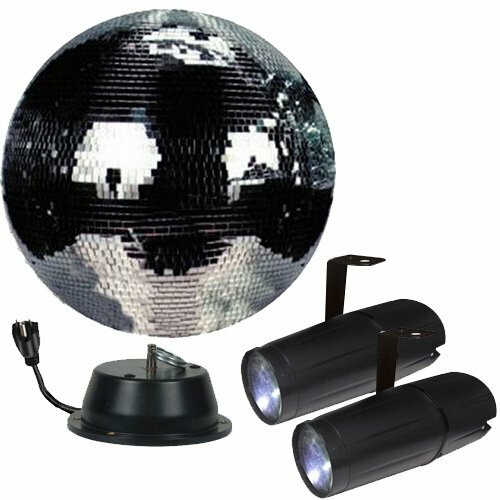 This complete kit includes a 16" glass disco mirror ball, a mirror ball motor and two high power super bright LED Pinspots. No light show is complete without the 16" disco mirror ball. When used with the included LED pinspot lights, this creates many light spots moving around a room. It's time to disco with this cool mirror effect. Set the room spinning when you project the bright pin-spot beams onto the motorized 16" mirror ball, and watch the party come alive! This kit contains everything you need to create dazzling mirror ball effects. Installs in minutes and is great for house parties, mobile DJs and permanent club installations. Our best value in mirror ball kits.